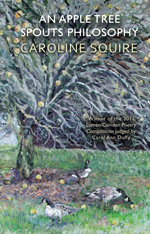 An Apple Tree Spouts Philosophy is the debut chapbook by Caroline Squire and is published as part of her prize for winning the inaugural Lumen/Camden Poetry Competition judged by Carol Ann Duffy. It contains the poem 'An Apple Tree Spouts Philosophy in an Office Car Park’ which was selected from more than 1,000 entries in a competition that raised over £2,000 for the homeless in two North London cold weather shelters. All proceeds from our sales of the chapbook will also go to support this charity. Caroline Squire was born in Dorset in 1962. She lives in Hampshire with her husband and two teenage children and works as an auditor. She is a part-time student of the Royal Holloway University of London, studying for an MA in Creative Writing.